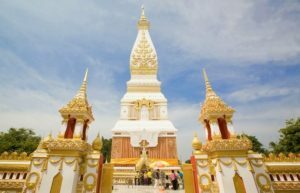 Nakhon Phanom (Thailand) – July 8, 2018 (travelindex.com) – Year after year, the Greater Mekong Sub-region is attracting more travellers. 2017 was no exception with record numbers registered for the members of the Greater Mekong Sub-region. Total international visitors arrivals reached last year 61.2 million (excluding Chinese Provinces of Guangxi and Yunnan). This represented a jump of 11.7% over 2016. In 2016, total international arrivals to the GMS passed for the first time the 50-million mark to reach 54.76 million visitors. Guangxi and Yunnan recorded some 9.5 million overseas visits in 2017 and if visitors from Hong Kong, Macau and Chinese Taipei included into the total, the number of “international” visits topped 18.77 million last year. Yunnan has the largest share of recorded foreign visits at 6.68 million last year, up by 11.2%. Guangxi did not release to date the total number of foreign visits. Thailand continues to have the largest market share of all international arrivals in the region. The Kingdom welcomed in 2017 close to 35.5 million visitors, a jump of 8.6% over 2016. Thailand market share shrunk slightly from 59.5% to 57.8% of all arrivals, a slight decrease due to the strong rise in international arrivals from Vietnam. Thailand retains however its lead and has the ambition to accommodate over 40 million travellers by the end of the decade. An ambitious program of upgrading airports and improve rail connectivity should help bringing more travellers to the Kingdom. Vietnam is consolidating its position as the GMS second largest inbound destination for international travellers. Total visitors arrivals reached last year 12.9 million, a jump of 29.1% over year 2016. This is due to a huge rise in total arrivals from China (+48.5%) but also to a more open visa policy from the government and, last but not least, to an increase in air connectivity. Many new international routes started from Hanoi, Ho Chi Minh City and Danang but also from secondary destinations such as Dalat, Haiphong, Nha Trang and Phu Quoc. Cambodia is now the third largest inbound market of all GMS countries with over 5.6 million international visitors in 2017, a growth of almost 12% over 2016. Cambodia is targeting 7.5 million travellers by the end of the decade. While main destinations remain Siem Reap/ Angkor and Phnom Penh, new resorts along the Gulf of Siam are increasingly positioning Cambodia into a seaside destination with more international flights landing in Sihanoukville. Lao PDR recorded last year a decline of 8.7% in total visitors’ arrivals, the equivalent of 3.87 million international travellers. The hosting of Visit Laos Year 2018 should invert the trend and let Laos seeing more visitors coming during the year. More flights connect these days Vientiane and Luang Prabang while by 2022, the country’s first high speed train connecting Vientiane to Kunming via Luang Prabang should boost arrivals, mostly from China. The excellent performance of GMS countries is mostly due to the dynamic of the Chinese holiday market. Except for Lao PDR and Myanmar, China is now the number one inbound market in the region, generating alone 25.8% of all arrivals to the GMS in 2017. Chinese travellers to Thailand is slowly approaching the 10-million mark (9.81 million in 2017, up 12% and a market share of 27.7% of all arrivals). In Vietnam, Chinese arrivals jumped by 48% last year to reach 4.01 million, representing a market share of 31% of all arrivals to the country. Cambodia received 1.21 million Chinese travellers last year, although a jump of 45% over 2016. Chinese visitors represent now 21.6% of all arrivals. While total visitors to Laos declined last year, China continued to grow. Total arrivals jumped by 17% equivalent to 639,000 visitors. China was actually the only large inbound source market for Laos to experience growth last year and representing 16.5% of all arrivals. Myanmar saw last year Chinese arrivals growing by 15.6% to pass for the first time the 200,000-visitors mark. China market share remains relatively small as it represents only 15.6% of all arrivals at international gateways (excluding one-day visitors’ movements at land borders).